Madison County is now teaming up as part of the Regional Planning Council, which is made up of representatives from 12 North Central Florida counties. The group will be forming a task force to come up with a solution. 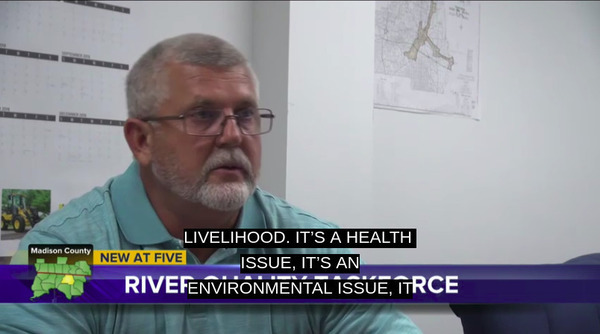 “It’s not only a Madison County issue, this is not only a regional issue around the basin, around the Withlacoochee, Suwannee River Basin. It has an impact all the way to the state level,” Davis said. 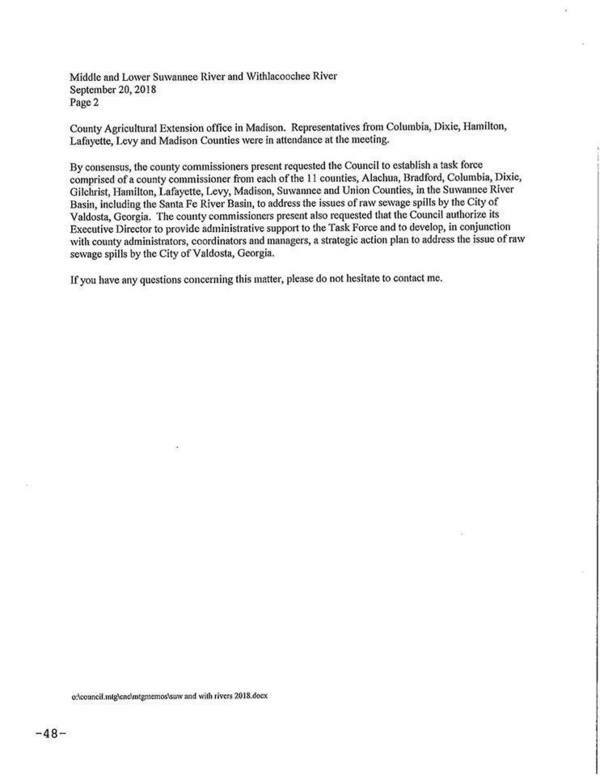 There’s no mention in what he said or in the letter establishing the task force of any other sewage spills sources than Valdosta. There are others, including Lowndes County, Quitman, Tifton, and as-yet-unknown sources elsewhere that we will only discover through frequent, regular, water quality testing at many places up and down the rivers and creeks. I did mention all that to Emma Wheeler, but TV reporters have limited time for their reports. Organizers also want to see immediate notification when a spill occurs, which they believe is not yet happening. The WWALS Watershed Coalition is asking for the same. Over the last few years, the City of Valdosta has invested millions of dollars to improve the wastewater treatment plants, including building a new multi-million dollar facility in 2016. “They’ve made a lot of progress, which is partly why it’s so frustrating to people. Why are they still spilling, they need to not be doing that,” Quarterman said. This task force is just getting started, but organizers are planning to hit the ground running. They hope to have the group formed and start developing a strategic plan in the next two months. 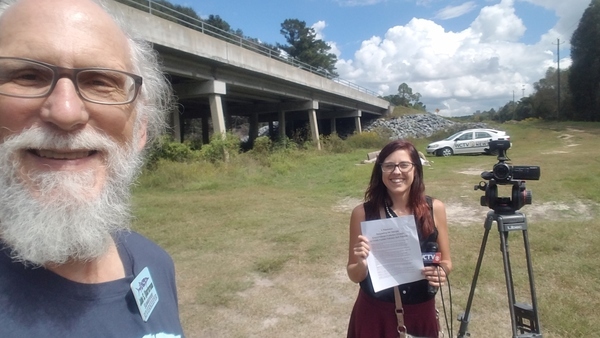 WWALS Watershed Coalition has started a petition that asks for the state of Georgia to require immediate reports of spills. The group is also asking local municipalities to support its water quality testing program to help keep the rivers clean. 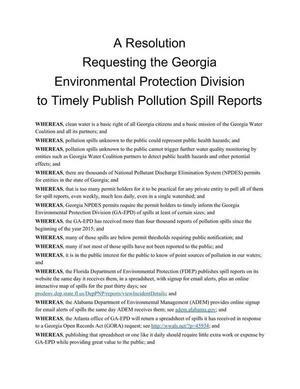 Here’s that Resolution Requesting the Georgia Environmental Protection Division to Timely Publish Pollution Spill Reports and how your organization can sign it. Commissioner Rick Davis represented Madison County at the North Central Florida Regional Planning Council meeting last night. During that meeting the RPC Board agreed to establish the Middle and Lower Suwannee River and Withlacoochee River Task Force. This task force will be comprised of a county commissioner from 11 counties, plus county administrators, and authorizes the RPC Executive Director to provide administrative staff support to develop a strategic action plan to address the issue of raw sewage spills by the City of Valdosta. The recommendation that was presented and approved is attached. Below is the text of the recommendation letter, OCRed by WWALS from the images Madison County posted. 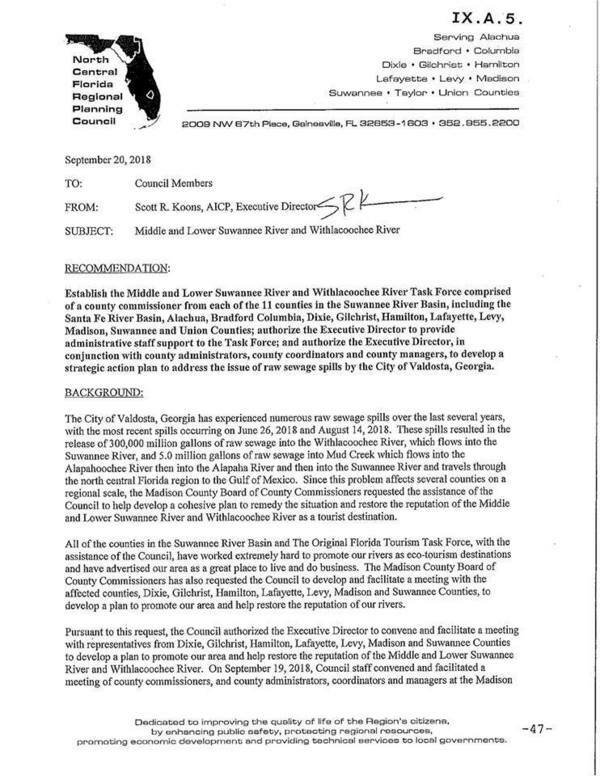 Note that the letter incorrectly calls both those 2018 Valdosta spills raw sewage when the August one from the Mud Creek WTP was clarifier effluent, which is one of the last stages before normal disinfected water release, as noted in Valdosta’s press release and WWALS’ report at the time, and as further explained Kenneth Lowe, Assistant Plant Superintendent of the Mud Creek Wastewater Treatment Plant at a WWALS meeting. Establish the Middle and Lower Suwannee River and Withlacoochee River Task Force comprised of a county commissioner from each of the 11 counties in the Suwannee River Basin, including the Santa Fe River Basin, Alachua, Bradford Columbia, Dixie, Gilchrist, Hamilton, Lafayette, Levy, Madison, Suwannee and Union Counties; authorize the Executive Director to provide administrative staff support to the Task Force; and authorize the Executive Director, in conjunction with county administrators, county coordinators and county managers, to develop a strategie action plan to address the issue of raw sewage spills by the City of Valdosta, Georgia. The City of Valdosta, Georgia has experienced numerous raw sewage spills over the last several years, with the most recent spills occurring on June 26, 2018 and August 14, 2018. These spills resulted in the release of 300,000 million gallons of raw sewage into the Withlacoochee River, which flows into the Suwannee River, and 5.0 million gallons of raw sewage into Mud Creek which flows into the Alapahoochee River then into the Alapaha River and then into the Suwannee River and travels through the north central Florida region to the Gulf of Mexico. 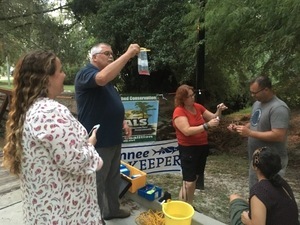 Since this problem affects several counties on a regional scale, the Madison County Board of County Commissioners requested the assistance of the Council to help develop a cohesive plan to remedy the situation and restore the reputation of the Middle and Lower Suwannee River and Withlacoochee River as a tourist destination. All of the counties in the Suwannee River Basin end The Original Florida Tourism Task Force, with the assistance of the Council, have worked extremely hard to promote our rivers as eco-tourism destinations and have advertised our area as a great place to live and do business. The Madison County Board of County Commissioners has also requested the Council to develop and facilitate a meeting with the affected counties, Dixie, Gilchrist, Hamilton, Lafayette, Levy, Madison and Suwannee Counties, to develop a plan to promote our area and help restore the reputation of our rivers. Pursuant to this request, the Council authorized the Executive Director to convene and facilitate a meeting with representatives from Dixie, Gilchrist, Hamilton, Lafayette, Levy, Madison and Suwannee Counties to develop a plan to promote our area and help restore the reputation of the Middle and Lower Suwannee River and Withlacoochee River. On September 19, 2018, Council staff convened and facilitated a meeting of county commissioners, and county administrators, coordinators and managers at the Madison County Agricultural Extension office in Madison. Representatives from Columbia, Dixie, Hamilton, Lafayette, Levy and Madison Counties were in attendance at the meeting. By consensus, the county commissioners present requested the Council to establish a task force comprised of a county commissioner from each of the 11 counties, Alachua, Bradford, Columbia, Dixie, Gileluist, Hamilton, Lafayette, Levy, Madison, Suwannee and Union Counties, in the Suwannee River Basin, including the Santa Fe River Basin, to address the issues of raw sewage spills by the City of Valdosta, Georgia. The county commissioners present also requested that the Council authorize its Executive Director to provide administrative support to the Task Force and to develop, in conjunction with county administrators, coordinators and managers, a strategic action plan to address the issue of raw sewage spills by the City of Valdosta, Georgia. If you have any questions concerning this matter, please do not hesitate to contact me.